A week ago, I started writing a post for my birthday. I wrote that 22 had started with crushing heartbreak. I described how the past few months have felt like speeding along on rollercoaster in the dark, complete with a feeling of uncertainty and a heady combination of thrilling highs and stomach-churning bad news. Everything I thought I knew has been questioned and every week seems to bring another life changing decision. I feel older - weathered by the wind. But you know what? It's my birthday. I don't want to dwell on the difficult parts of this year, or how the thought of my future fills me to the brim with a potent mixture of deep excitement spiked with fear and self-doubt. No celebration is complete without CAKE. 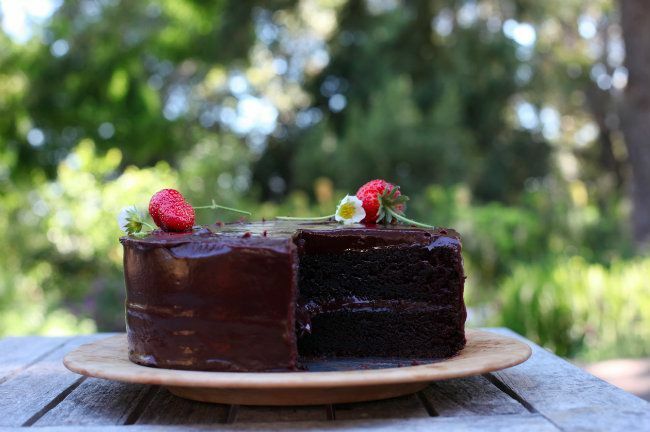 This cake is that chocolate cake, a recipe I'd heard whispers about. In our borrowed Berkeley home, the Scharffenberger chocolate book was left on the kitchen island. It had a sticky note marking that page and five stars etched in pencil at the top. How could I resist? Mum and I made the cake together. I finished it off with some strawberries and strawberry flowers from the garden. 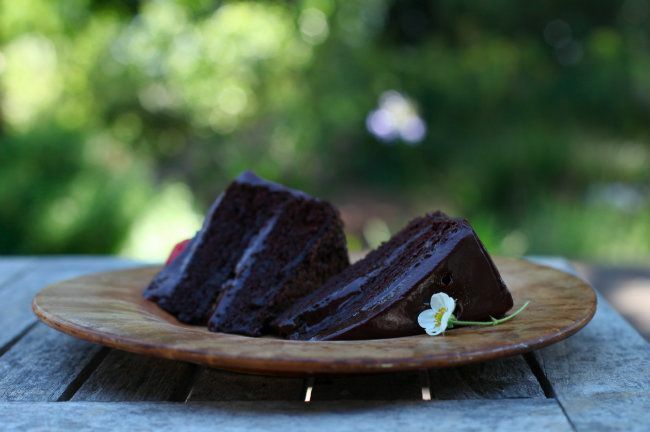 It's a fudgy, dark chocolate cake - and surprisingly not too sweet. I was highly skeptical about the amount of sugar but decided to follow the recipe faithfully. If you can't find the 99% chocolate for the icing, I'd try a different ganache recipe (perhaps double the example here) - a lower percentage would make it too sweet. Finally, a few days ago I bought myself an early birthday present with the prize money from the Guild award and some savings. I bought a Canon 5D Mk II and a 1.4/50 to replace my old Sony DSLR. I swore I wouldn't upgrade until I really needed to - my lovely friend Erin helped me realize I'd hit that wall. I still feel slightly at sea but I'm really pleased with how things are developing so far. We ate the cake outside on the decking. It has been a gorgeous, blue-skied day. Start with the icing. 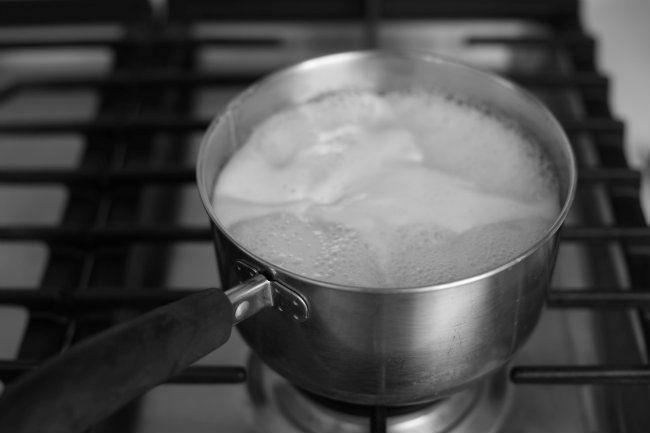 Combine the cream and sugar in a large saucepan. Put over a medium heat and bring to the boil. Once it starts to properly bubble, turn the heat down to low and simmer for 6 minutes. It foams up a lot. Take off the heat and leave to cool for one minute then add the butter and chopped chocolate. Stir until smooth then transfer to another bowl and stir in the vanilla. Leave to cool, stirring occasionally. Preheat the oven to 180C/350F. Butter, line and flour two 8" cake tins (not ones with removable bases, the batter is too liquid). Place the sugar, flour, cocoa, baking powder, bicarbonate of soda and salt into the bowl of a stand mixer with the beater attached. Stir on the lowest setting until a uniform brown colour. Add the beaten eggs, milk and canola oil then turn the mixer up to medium and beat for 2 minutes. Boil the kettle while it beats then turn off and pour in the water. Mix it on low until smooth - it is very soupy. Divide between the two tins - I think mine were 650g each but I forgot to write it down. Carefully transfer to the oven and bake for 30-40 minutes or until a skewer can be removed from the centre cleanly (mine took 40). Leave to cool on a wire rack for 5 minutes in the tins then turn out and remove the paper. By the time the cakes are totally cool, the icing should be thick enough to ice - it should hold its own weight. Place one of the cakes onto a serving plate lined with paper strips. Spoon some of the icing into the middle and spread it out. Add the top layer then spoon about half the rest of the icing onto the top. Drag down and over the sides and smooth over. Add the rest as you need it, working fairly quickly. Use a palette knife dipped in a jug of hot water then dried with a towel to get a shiny finish. Watch out as you move it - the layers can slide a little until it sets up. Add any decorations, final flourishes and candles then slice and enjoy. EDIT 13/6/12: We've found that the cake got even better the next day, and is still lovely two more days later, though the icing has clouded and is slightly speckled. It'd definitely be the perfect cake to try if you needed to make it the day before a party or event. This tasted different and delicious. 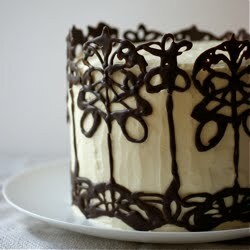 There is a beautiful balance between the sweet frosting and the moist cocoa cake. I can see exactly why it is called "THAT chocolate cake". Happy Birthsday to you!!! i hope you Will have a wonderful Day and Congrats with your new camera! Have a happy and wonderful birthsday! Happy Birthday Emma - can't wait to see what you get up to with your new camera. Did you take these pics with it? They are absolutely lovely. Happy Birthday to you. Congrats on the new camera... thank you for the many wonderful photos and recipes. Happy Birthday Emma- Hope you are hving a lovely day! Let's hope 23 is just as thrilling a rollercoaster for you with only highs! Happy birthday Emma, I hope this year brings you lots of highs and not quite as many lows. Happy Birthday :) I love your blog!!! I wish you a wonderful day! So lovely that you were able to use the Guild Award prize to buy a new camera which you will use to take even more lovely picturex for the blog. Well done on the award and happy birthday. Hope the year ahead is full of only good things. Happy Birthday! And what a pretty cake! Well, may God bless you on your 23rd birthday. May this year be a turn in your life where abundant blessings flow into your life and prosperity gushes out like a spring. :) Blessed birthday! Many,many happy returns! It's going to be a wonderful year, you'll see. Beautiful cake for a beautiful party girl! Happy birthday! 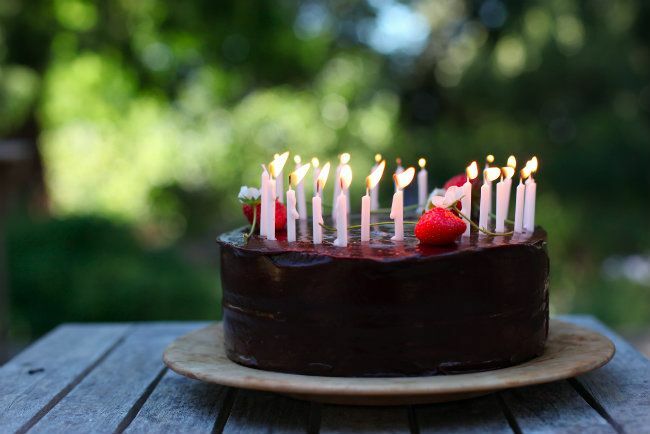 I know how you feel, every birthday is like a milestone toward something new and exciting, it is a blissful feeling, keep it close to your heart! Hope to see you soon in London! monstercircus - I definitely had a happy and wonderful birthday - thanks for your kind wishes! Sally - I did, yes! The first food I shot with it. I'm so glad you like them - I've been in such a rut recently. K.Nelson - Thank you for reading and appreciating them! I'm so excited about the camera. Sips and Spoonfuls - I hope it has only highs too! Thank you for the kind wishes Sukaina. london bakes - Thanks for the sweet hope - I do too! laura@howtocookgoodfood - In America they don't seem to have caster sugar and so appear to always use granulated instead. I've always baked mainly with caster sugar but it doesn't seem to make too much difference to the things I've tried so far. I'm so glad you like the photos! Kavey - I was so pleased that I could put it towards something relevant to the blog rather than just bills etc - it meant I had enough to buy it all as it covered about 1/4 of the cost. mondomulia.com - Thanks Giulia! It's gorgeous, isn't it - my friend Erin has one too and so she recommended it. I was thinking of going for Canon anyway but it swung it! Katrina - Thanks - I thought the strawberries & flowers would make for a pretty cake! Though I felt guilty 'killing' 3 flowers before they became strawberries. Princess Dory - Nice to know you're 23 too :) Thank you for the kind blessings and I hope you enjoy the cake when you make it. Happy Birthday! I'm sorry to hear that your past year has been filled with so much hurt and chanllenge. I love your Blog. Is it possilbe you could also list the US equivilents. I'm not confident about converting the recipes. I would sooooooo appreciate it. Blessingss! Big birthday wishes to you, Emma, and congratulations on your Guild of Food Writers award. That's fantastic! Mlgauer - Thanks! You can find this recipe online with US measurements here. I often transfer from cups to metric and this is the table I use. I'm afraid I'm a huge fan of metric and really believe in the use of scales for baking so I won't provide cups alongside. Eileen - It's a great cake. Easy too - you should make one for yourself! Gretchen - Thanks Gretchen! Lovely to hear from you, I hope all is well with you? Happy Birthday! The cake looks delicious. Emma: Happy birthday and enjoy it very much. Greetings from Lima, Peru. that is gorgeous! 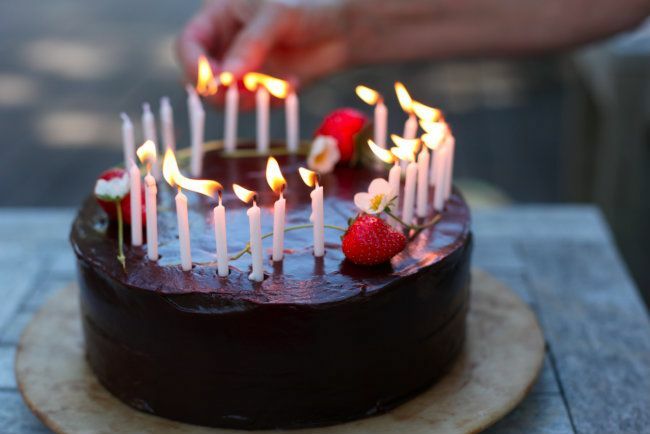 when I was yougner, my mum used to buy these chocolate cakes from a very famous bakery for our birthdays, called Lana's, it was so good you had to pre-order a week in advance, the thign is, your cake, with the layered fudge and dense sponge is exactly how it looked like. it's a very promising recipe I hope I will be able to master, and if not, it brings back lovely memories anyway. happy birthday! Happy Birthday! The cake looks gorgeous. Fantastic.. I love the added wild flowers too an incredible looking cake..
Did you eat any for breakfast? Madison Mayberry - We're so enjoying our time here - I adore it. The food is so good! Or you'll have to take a tour of England or Switzerland! Elizabeth - Thank you! It was delicious. Celeste - I did enjoy it very much - thank you for your kind wishes all the way from Peru! fanny - I hope it involves happiness, glitters and sprinkles too! What a lovely way to put it, thank you. Shu Han - What a sweet story! I so hope this recipe recreates that cake for you - it's so wonderful when you can bring a little bit of childhood back with a taste. Simran - Thank you, I'm so glad you think so. Charmain - I thought the flowers would be pretty and I liked that I could use the long stems to give a bit of height. I didn't eat any for breakfast but I have had it for elevensies two days in a row! Emma! It's such a thrill to see that you are already putting your new camera to such beautiful use. As a fellow Oxford alum and Berkeley native I couldn't help seeing you're in the city of my birth, and was overcome with the need to tell a stranger to eat things. ITs hard - Berkeley people can't help themselves about food. Everything in San Francisco, but I have to just insist you (total stranger to total stranger, so you can obviously ignore me) go to Zuni Cafe and order the roast chicken to share and have the caesar salad to start. Just trust me on this. You're in the best part of the world (and I'm in rainy old London) so ENJOY! Lovely recipe and as a recent (ish) transplant from the UK (originally Devon too..) to Southern California, I'm very happy to jump on the Scharffenberger bandwagon. I love his chocolate the best out of all the so-called 'artisanal' stuff - his 68% dark milk chocolate is beautiful. Like the best Easter egg you've ever eaten. Meltingly dark but not too heady. Hopefully you can get it sent to you....and congratulations on the award. Happy belated birthday! The cake looks gorgeous - just very simple decoration has made it look very elegant! Happy belated birthday! I Love your blog! Happy Birthday (if a little belated). Hope that the next year and all those beyond brings you all that you hope and dream for. Happy birthday! I'm about to make this as a Father's Day cake! Fingers crossed it works...I'm not exactly confident in my ability haha! What other decoration would you suggest instead of the strawberries? The Browns - Aw, thank you! I've been to Zuni (had the caesar but mum didn't fancy the chicken - another time!) and Chez Panisse and have Cheese Board on the calender but will definitely check the others out! We're running out of time - so sad - I love it here. breakfastandotherstories - How lovely - I can definitely see why someone would move here! Scharffenberger is wonderful, isn't it - I must try the 68%. The best one I've tried so far is the sea salted almond milk - delicious. Becs @ Lay the table - Thanks! I thought it would look a bit plain without something else. marie luisa - I'm so glad you like it! Thanks for the kind wishes. Domestic Executive - Aw, thank you. I think it will be a good year! Adelle Barry - How funny! Yes - I was in a lot of science classes with Dean. So glad you gave it a go and loved it - it's a wonderful recipe. Sinead Slattery - What a lovely idea. Does he have a favourite chocolate bar? You could decorate the top or sides with it? i.e. maltesers on top, chocolate buttons, slices of mars bars around the edge, kitkats around the sidesetc etc etc. Or any other fruits or maybe sprinkles - loads of possibilities! Happy birthday!! Hope the coming year will be everything you wish for and more :) This cake looks perfect for celebration - you can't go wrong with chocolate in my book! Oh my gosh that looks incredible! Lovely photos too! Happy Birthday! Belated happy birthday! I want to try THAT chocolate cake because it looks absolutely scrummy. I remember my 23rd birthday. My hubby surprised me with a chocolate cake. I am all of a sudden wistful, time flies so fast. Made this a couple of days ago for a birthday party - it was, without doubt, the best chocolate cake recipe I've ever tried. Thank you so much for bringing it into my life! That's wonderful! So glad you liked it. I made this for my sister's birthday dinner yesterday (she recommended your blog to me in the first place). The cake was fantastic and we've had people asking desperately for the recipe so thank you for posting it! I'll definitely be following your beautiful blog in the new year. I like to cook, love cakes, but rarely bake them as my wife does it so much better. However I like to do something for my friends on my birthday (one year I made a japanese meal from scratch, it took two days to prepare!). I decided on a whisky chocolate cake combing two of my favourites (after all it is my birthday!). I have looked online at many different recipes but kept coming back to yours. Tomorrow I shall pick up the ingredients and 'make me a cake'. We shall be scoffing it on Saturday which will give it the day to mature you recommend. Will let you know if you should have come for cake!!!!! THIS CAKE IS INCREDIBLY MOIST and NOT TOO SWEET. it's a keeper. It looks amazing! I love it when people attach pictures, thank you. Brilliant! It's a famous recipe for a reason. I hope it went well? I like the idea that you make something for your friends on your birthday. I'd really love to make this but can't find 99% chocolate anywhere. 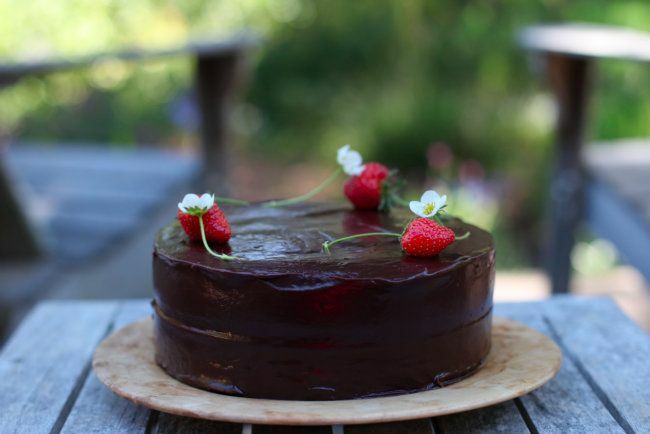 If I used 85% could I still use this ganache recipe, but with slightly less sugar? Thanks! Hi - you could try reducing the sugar, but I've never tried it. Personally I'd try doubling this recipe (without the buttermilk, replace the amount with more cream). Hope that helps! What can be used as a good substitute for eggs in this recipe? Hey! I'm afraid I don't really know, I've never tried it and don't know anything about egg replacement really. Perhaps a good vegan site might have some suggestions? I just made this cake because I felt like having to bake something, and I am so pleased about how it turned out! I hope it tastes as good as it looks! Thank you so much for the recipe! It looks wonderful! So pleased you liked it. hello! this looks awesome :) But may i know if I have to refrigerate the cake? I made the cake one day in advance. Will the ganache harden? I didn't refrigerate the cake, no - it was fine for a few days in a tin. I guess the icing might harden up if you do but I'm not sure. The only thing is that mine came out soo thin, but I guess that's just the mold size. Thank you VERY much for this recipe!!! ♥ Everybody loved it!! How do you think this cake would do if the oil was replaced with brown butter? I'm not sure - I think the flavour might get lost behind the chocolate and I'm not sure how the different fat would react - but I'd absolutely love to find out what would happen, so do tell me if you try! Well, the cake came out lovely! I used your calculations from the brown butter pound cake recipe to get the amount. I'm not sure if I tasted it in the finished cake - I made this cake once before according to recipe, but that was a year ago so I can't really compare. I could taste it so strongly in the batter though, at the stage before pouring in the boiling water - it took all my self control not to just eat the batter! If anything it would've made such a nice icing.. Anyway, it was for a birthday party so I wasn't really able to focus and try to pick out the flavours (it got devoured fast). I would cook it using brown butter again tho, for sure. I might make the cake again soon so I'll try to pick it out then. I have the book and I have made this cake many times. It is so wonderful! There has been no other chocolate cake that I have tasted that compares to this one. Three cheers for "That Chocolate Cake". This cake is amazing! I made it for my birthday back in March. Wish I could say it was for my 23rd, but much closer to 30... It was a lovely sticky, rich cake with a perfect crumb and was super popular with all the guests. I changed things up a little for the ganache, since it's hard to get bittersweet chocolate affordably in South Africa. Instead I used a dark chocolate, probably about 70%, but which had a higher sugar content than the bittersweet chocolate you get in the EU/UK. I stuck pretty much to the recipe but I didnt add the sugar. Once the ganache was all melted and ready I added in very little sugar and cocoa powder to get the taste to the perfect chocolately-sweetness, which is not too sweet where icing goes for me. I also sandwiched the cakes with cream instead of the ganache and then covered the outside with ganache. Turned out really well. Sounds wonderful! I'm glad you enjoyed it. Also, how much better is this chocolate cake from the one you made in the "Beautiful and damned cake" recipe.